On Wednesday, January 24, Regent University School of Divinity professor Dr. Alemayehu Mekonnen spoke at university chapel. Mekonnen hails from the African nation of Ethiopia. While there, he worked with Reach Global, then referred to as Evangelical Free Church of America International Mission, from 1997-2005. Although he’s faced resistance for his faith overseas, Mekonnen has never ceased to boldly proclaim the truth of the gospel. 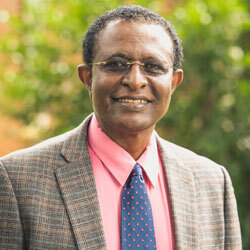 While at Regent, he’s played a key role in developing the School of Divinity’s mission emphasis for the M.Th., M.A. and M.Div degree programs. In his sermon, he urged students to carry God’s word into the world — one in which vast amounts of people have abandoned the gospel and embraced secular ideologies and systems of thought and belief. Converting to Christianity contrasts the ideology to the enlightenment because not only is it a process in which one must die to themselves and their pride, but is one in which individuals find purpose in God’s call on their life, he said. Mekonnen also said that poor communication hinders believers from sharing God’s word. Even those who grasp proper theology are ailed in their attempts to do so; in short, bad communication limits effectiveness and opportunities. Rather, communicators should work to learn the most effective way to share messages with people in other cultures, he said. In the end, however, a person’s efforts to share the gospel are futile if they don’t wholly embrace the Bible and preach a gospel message that is not only doctrinally and scripturally sound, but most importantly, points to Christ as the only means to salvation.